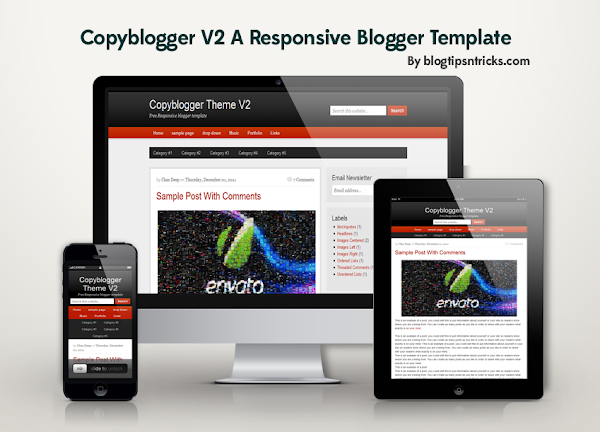 Copyblogger-v2 a Responsive Blogger Template. This is a Updated version of the Copyblogger Blogger template. It is a Responsive blogger template with a clean minimal look and has inbuilt features such as Multiple Author Info widget, Threaded comments system, Search Box, Custom follow by email widget, etc... It is a SEO friendly theme, fast loading, low errors in W3c Validation and can be viewed in any resolution(Any size window Or devices). I hope you like the new version of this template. 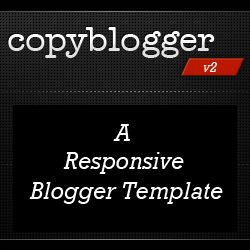 Click the Browse button and locate Copyblogger-V2 blogger template. Below that you can find the following code. Replace the Chan Deep with your Profile Name and chandeeban with your twitter username. Replace the image link with your avatar image url. Then Customize the Author Bio your own. Replace GUEST-BLOGGER-NAME with your guest author name and the GUESTUSERNAME with guest author's twitter username. Please leave your Precious Comments about this template and share this Template with your friends. Thanks for updating this copyblogger theme error free for blogspot platform. I am using this copyblogger theme on my blog technicpage.blogspot.com since one year. It rocks. Please send me the link into 0311basit(at)gmail(dot)com. This is Gireesh from CoreBlogging. I made a list of 'Top Best Free Responsive Blogger Templates of 2012' and I have featured this template on that list. Please visit Top Best Free Responsive Blogger Templates to see the rating of this template and leave a comment. hey bro password is not working...!! bro i try but working....!! Hey dude how do you clone a template. pls . need help contact me . www.dilipyadav@gmail.com . getting stocked in between. Any help files on resizing or swapping the background image? Responsive themes are such a great way to customize look on various platforms. Now designers will have more control over the looks of the site on various devices. Anyways, I'll try this template for sure! This is really interesting. I think you copy and and paste the theme code in the template editor. i will advice you check this yourself to confirm my words.uploaded and not paste. thanks man ,i finally got it.you never instruct i have to unzip before uploading.anyway it working fine now. Below that you can find the sub menu code. After the Sub menu code add the Adsense code. Note:- To make the ad visible you have to phrase the adsense code. Very nice, it's so perfect. It was same as wordpress version. I like it. first thank you for your template. very nice template. i like it somuch.. brother please help me how to change background color or image in this template.. plz help me.. thank you..
To change the background color search for the following code. hey.......! Chan deep, I like your template, so i use in my blog "technictweet.com"
but i have a problem in this template, before break element Image not showing in my home page, when i post something. For showing Image,I specially post image in left. And leave a comment link will disable, I try more but i can not success. Please solve my problem, my mail-"gautavtweet@gmail.com". I am waiting . Hi Gaurav, you have edited the attribution link. you're not supposed to edit it. So, give the attribution link back or change the theme. After adding the attribution links let me know. I am waiting for your solution. how i can add attribution link. You can find the attribution link on the footer for the Copyblogger-v2 theme(now you have removed it). you've to add it back. hey.....! dude, I have add attribution link and I restore my template on "technictweet.com". but comment box not appear and Image also not appear, next Tell me what I do . Hi, It seems that you've removed the attribution. you're not supposed to remove the attribution link. Let me know after adding the attribution links. I do not understand, just saying that the widget are above the footer. as shown in this picture. The problem of this them is: when I ad "Auto Read more thumbnail" to blog, the length of blog is not enough for "popular Post", not same as other themes. It means if the post short, the list of "popular post" will not enough space. I like this theme very much but this is still a small problem. Please support me to fix it. Please visit my homepage, the situation is not fixed till now. you can find the password below the confirm link on the confirmation mail. check What People Reading Right Now is overlapping the footer.... Please tell me how to fix this. Hi Krishna, Sorry for the delay... I've Updated the theme now, Every bugs and errors fixed. To get the UPDATED VERSION Just Re-download the theme and upload it on your blog. How to edit max-results on Page navigation ? To edit the max-results on page navigation. in that replace 5 with your max-results. no se ve bien en Internet Explorer 10. O será la configuración de mi blog? P.S. Pls use English when you comment again, Thanks. This is theme and the article is excellent. But I can't download it. Please adv. how can I download it? How i add Read more link in posts of copy blogger template ? thanks alot chan deep ji. if i add your link at my blog footer, why dont you add my link in this awesome blog? haha, just kidding, great template, please visit my new blog at Onelizious to see how coppyblogger v2 theme do the magic, and thanks for share it. Its because my public (and me, of course). But the structure are really awesome. ultra-customizable-theme. hi......bro menu bar i can't edit it.....not found. Thanks for sharing this valuable resource. terimakasih, bisa langsung saya coba. The sidebar is less than 300px in width.. Please help me with these as I'll be using this template for along time and may even pay to remove the footer links in the future..
Can you give your blog link. So that I can check the author bio prob. The width is fixed and for browser error I'll try to fix it in the future update. http://www.topratedtips.com is the blog. I'm interested in removing the link and have the blog fully customized. I'll contact via the contact form as suggested. Thanks in advance for helping out..
Amazing Template. Thanks for sharing..
How to remove drop down menu? I don't intend to make use of it. Kindly reply. Why the menu is hidden when it is on homepage now, but it appears on page/post. Hi, Chandeep J why the navigation menu (on red block) doesnt appear anymore? OK. thank you very much Chandeep, It has been OK. I like your template with right color theme for autocad. I think. simple, and keep focus on the subject. Thanks for a really cool template. I'm sorry but once I upload the .xml template what do I need to do? I mean, how does one customize the main and sub menu. The instructions you've given above don't work. E.g. I search for > I don't find anything. I also don't see any option to 'Expand Widget Template' as you've instructed above.